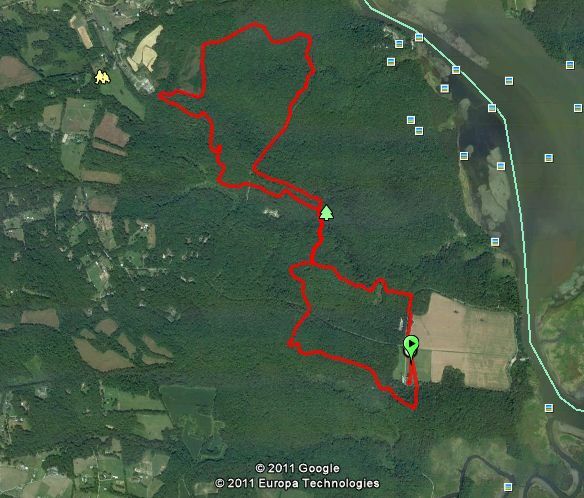 This past Saturday I ran the first annual Patuxent River Trail 10k. 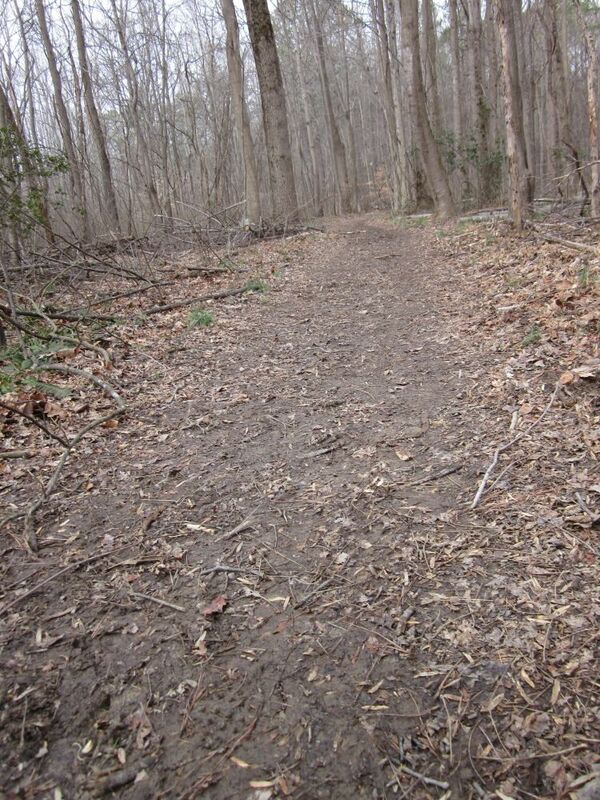 According to the race director, the Quantico Orienteering Club was hoping to break even with 50 runners. Fortunately for them and the Patuxent River Park, which the race money went towards, about 200 eager runners lined up at the start. When KFB and I pulled up to the parking area, I was giddy with excitement. This was my first trail race, and the vibe was exactly as I had hoped. Runners slightly bundled from the morning chill were stretching and warming up in a giant corn field, the packet-pickup was located along side an old barn, and no one seemed to care about the mud we would soon be tromping through. As we all lined up just before 10:00, laughter filled the air. As the race director yelled “Go!” we all took off across the large field towards a small funnel which served as a gateway to the trail. Most of the course followed a horse trail, wide enough for two people. The only major concerns were the mud and a few down trees, which made for some quick changes in the path and a little contact between you and other runners. I didn’t see anyone slip, but I’m sure it happened. Taking off across the field, I went out way too strong. After the first quarter mile, I was about 1 minute under my typical 10k race pace, and it was on trail. I quickly realized that almost everyone had gone out too fast, but soon we all started to slow down and fall into a nice groove. While I was no where near the front, finishing about 10 minutes off the leader, the tight course made you feel like you were really racing. Picking someone off, or being passed, was brutally obvious as you had to nudge past them. I would set my sights on someone a few runners up, and go for it. This strategy seemed to work pretty well as I was doing more passing then being passed. The course itself was relatively flat, with a few short and steep sections along the middle. Knowing nothing about the course before race day meant that I didn’t expect to run so quickly. This was a nice surprise and every time I looked down at my pace time I got more excited and energized. I crossed the finish line in the top 1/5th of the pack, which I’m pretty excited about. Not that I’m ever too concerned about my time, it still feels good to run faster than expected. The race was very well run, especially for a 1st annual, and one that I hope to come back to next year. Thanks to all the organizers and volunteers who put in the effort. You can check out what the information gathered from my Garmin Forerunner 305 below. The first is a GoogleEarth image of what I actually ran, and the second shows the elevation chart. Did you fall? You should write more about falling. Actually, this was a well-written blog…well-done, very good. In all seriousness, though – cool to see the Garmin image – you should draw a picture! Also, finishing 10 min off the lead in a 10k is great! What was your pace? Also, I miss the feeling of having to nudge past people when passing them – …run faster. I was pacing right around 8 minutes, which I was pleased with considering. While being passed in such a tight space wasn’t fun, I have to admit that passing did feel pretty good. Great report! I miss trail running. There’s something nice about the unpredictability of a trail. So… organic, for lack of a better term. Congrats on the strong finish! Thanks Tim! You are right, the unpredictability does feel organic, natural, free range…oh wait, now I just sound like a food label… But seriously, it is freeing. Nice race man, sounds like a lot of fun. And see you got beat by a 13 old…(j/k, j/k!) But seriously, a 14 year old kid won? That’s insane. Ha! I think I was actually beaten by TWO 13 year olds, AND a 60 year old. Where do these kids come from??? Winning a race is just something I doubt I’ll ever experience…I guess you’ll just have to tell me how it feels. 400+ photos from the 10K are now posted online, and they are tagged by name and bib number to make searching easier. And yes, there’s one of you – right here! Thanks for sharing the link Greg! Wonderful race.